When Kawasaki announced the 2017 Z125 PRO, it appeared to be a direct response to the Honda Grom, which had been introduced to the U.S. market back in the 2014 model year. 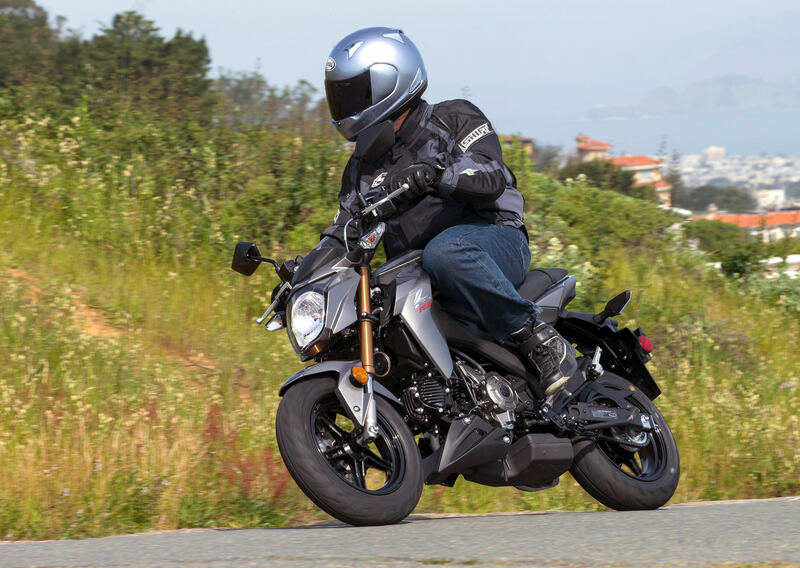 When Gabe tested the Grom, he found it a fun, unintimidating mount that might be the perfect entry point for new riders, particularly at the relatively affordable U.S. MSRP of $3,199. Frankly, we had no idea whether the Grom would sell in significant numbers. Well, the Grom has sold very well and, according to Kawasaki, it is the second best selling model in the “small street” category, behind Kawasaki’s own Ninja 300. Other bikes in this category include small displacement models from Honda and Yamaha, for example. Kawasaki wants a piece of the action, and the result is the Z125 Pro. The Z125 PRO is an extremely compact and light (claimed curb weight is 225 pounds with a full two-gallon gas tank) motorcycle with a low seat height (30.7″), powered by a 125 cc air-cooled SOHC single. 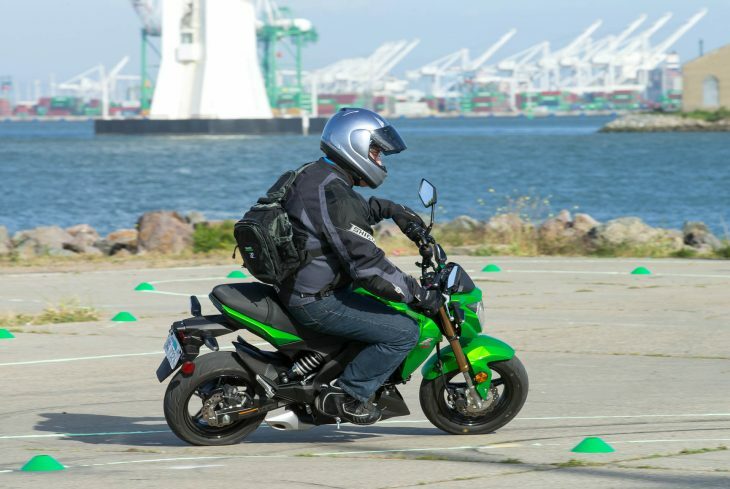 Kawasaki claims that the fuel injected engine is “tuned for responsive acceleration” with power delivered through a four-speed transmission utilizing a manual clutch (just like the big boys). The 12″ wheels are cast aluminum and carry 100/90 and 120/70 tires front and rear, respectively. The non-adjustable inverted fork is 30 mm in diameter, and the single rear shock (offset and without linkage) is angled to offer some progressiveness and offers four-position preload adjustment. The Z125 PRO features a steel backbone frame and a box-section swingarm. There are disc brakes front and rear, with a single 200 mm disc in front and a 184 mm in back. Kawasaki went to great lengths to style the Z125 PRO to resemble its larger naked siblings, the Z1000 and Z800. 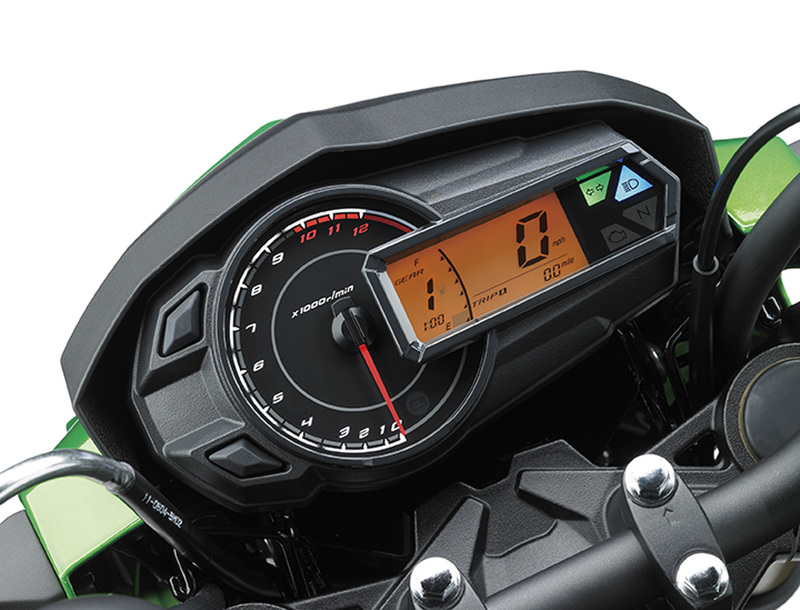 Instrumentation on the little Z125 PRO is impressive and thorough with a very legible analogue tach and a high contrast LED screen containing loads of information … even a fuel gauge and a gear-position indicator. Nice details include a sculpted two gallon gas tank with excellent knee cut-outs and petal-shaped brake discs. The underslung exhaust adds to the upscale design. Your sense of style may differ, but we find the Z125 PRO modern and sharp looking. 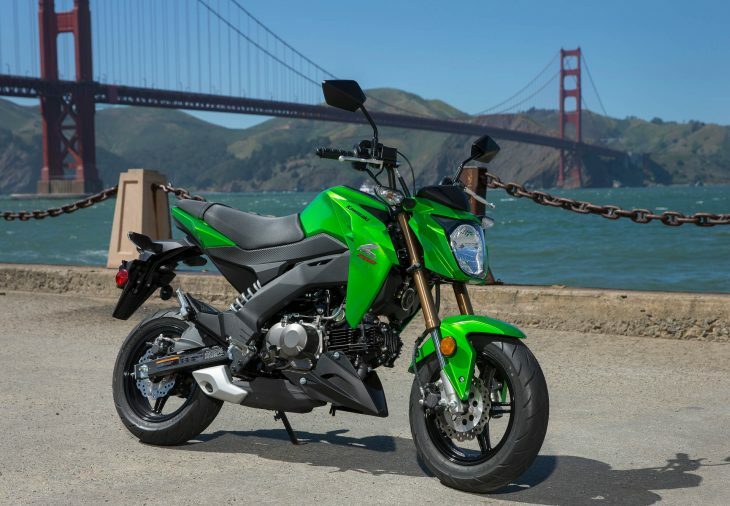 Kawasaki has priced the Z125 PRO at $2,999 in the United States … undercutting the Grom by $200. Compared to the Grom, the Z125 PRO has similar engine displacement, but a significantly larger bore and shorter stroke. The Grom has wider tires front and rear and a shorter seat height (29.7″). Both bikes are four-speeds, and the Kawasaki has a significantly larger gas tank (2.0 gallons vs. 1.45 gallons). Claimed curb weight is the same for both bikes (225 pounds). Suspension travel is identical for both bikes (3.9″ in front and 4.1″ out back). Together with a shorter stroke, the Kawasaki engine has a higher compression ratio than the Grom (9.8:1 vs 9.3:1). We have not done a comparison, but we would not be surprised if the Kawasaki has higher peak horsepower than the Grom. The Z125 PRO redlines just south of 10,000 rpm. A Kawasaki representative told me at the press launch that a surprisingly diverse group of customers has been buying the Honda Grom. Both new and experienced riders. Riders who like to race their friends in parking lots, and retired riders who want a lightweight bike to carry on the back of their motorhome. Racers who want a pit bike. 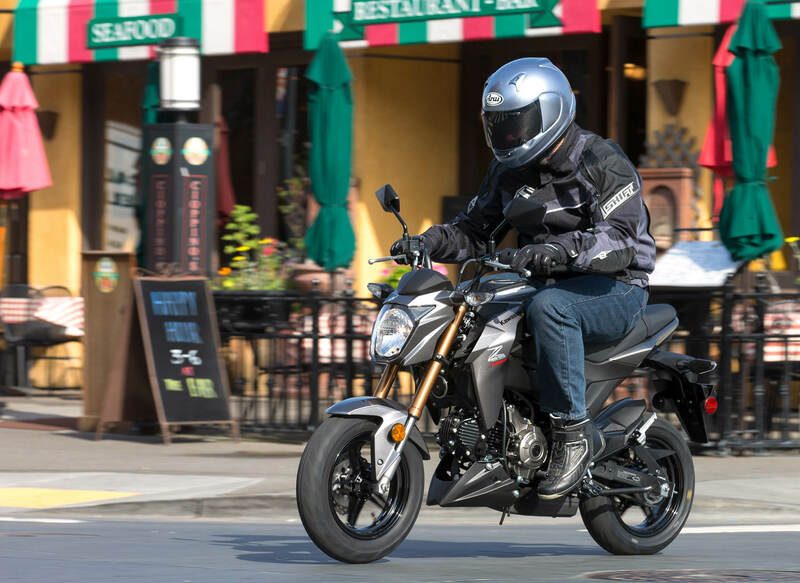 Demand seems diverse, and somewhat unpredictable, but the Grom market is expanding and Kawasaki expects that it can feed this market with significant numbers even if it does not take sales away from the Grom, i.e., this market will continue to grow quickly. We tested the Z125 PRO through the streets of San Francisco one morning last week, followed by a late afternoon ride on nearby Treasure Island. The Z125 PRO is not freeway legal in California, so we stuck to city streets and boulevards — even sampling the famous steep hills of the City. With several 200+ pound journalists attending (including yours truly), it seemed as if we were all constantly WFO. The Z125 PRO never blinked. We never opine regarding long-term reliability after a single ride at a press launch, but after watching this aggressive group of riders perform stoppies, wheelies, drag race launches, burnouts (yes, burnouts!) with frequent redline-limiter bounces, I was impressed. We were switching bikes all day, and I fully expected the clutches to be fried on some of them that were more thoroughly abused, but it didn’t happen. If I had to guess, the Z125 PRO will likely be bomb proof over the long haul. I was also very impressed by the suspension action. The small, narrow tires encountered very rough roads (including several square-edged potholes) throughout the day, but both the fork and the shock absorbed the punishment surprisingly well … feeling both plush and controlled. Together with very nimble, but stable handling, these little bikes were a blast to ride. There is more leg room than you might expect on such a small motorcycle, and the seat provided good comfort and decent support throughout the day. I might have liked the bars to be a little bit taller, but that could be easily changed with an aftermarket unit (more about that later). We rode the bikes through a timed course on Treasure Island late in the day, and my initial efforts to ride “supermoto-style” with my inside leg extended were frustrated by the low bars. New riders will have to get used to a relatively abrupt clutch engagement, but at least it was consistent throughout the day. The transmission shifts well, although shift lever travel is fairly long and finding first gear at a stop sometimes required rocking the bike forward or backwards. None of these were significant issues, however. The brakes were plenty strong, and the front brake, in particular, offered very good feel. If you like to perform stoppies, or if you would like to learn how, this is an excellent bike. The Honda Grom has a larger 220 mm front brake disc with a dual-piston caliper, but I don’t recall that brake being any stronger than the one on the Z125 PRO. Overall, the Z125 PRO seems to have plenty of braking performance given the weight of the motorcycle. There is a relatively generous passenger seating area (for such a small motorcycle) and passenger pegs. Although we didn’t test with a passenger on board, Kawasaki says the Z125 PRO has an ample GVWR of 578 pounds. We found the instrumentation legible, and it was nice having a gear position indicator. I’m not sure I ever saw the fuel gauge move … not surprising given the 2.0 gallon tank and rated fuel economy north of 100 mpg. Aftermarket suppliers are already busy producing exhaust pipes, handlebars, anodized bolt-ons and other products for the Z125 PRO. The Honda Grom has spawned a customization demand that we never saw coming, and Kawasaki is ready for something similar with regard to its new model. The 2017 Kawasaki Z125 PRO is a well finished, refined package for a first year model. It looks like a lot of motorcycle for $2,999, and after riding it hard (even racing it at the end of the day) we can say that it performs well for its category, and will give the Honda Grom all the competition it can handle. It is available in two colors (both shown), including Candy Lime Green and Metallic Graphite Grey. The Z125 PRO should be in U.S. dealers this month. Visit Kawasaki’s web site for additional details and specifications. Now they need a Z400 and Z600 to really round out that line-up. Don’t be shy. With a GVWR of 578 pounds and a curb weight of 225 you can pig out to 353 pounds and buzz the neighborhood. Men will gasp in astonishment, mothers will bring their children inside. This little bike is for 35mph roads, this bike will be all fun and Kawasaki does not close its dealers like some other brands. Um, our local Kawasaki dealer closed a few years ago. Mine too. I’m riding up to the next nearest Kawi dealer tomorrow to look at a 2016 Versys. It’s 90 miles from me. We had a Kawasaki dealership near me close shop during the recession. Of course there are 50 others around here, so no one really noticed. It can do more than 35 I’m sure. I had a Zuma 125 for a year that would push 50 stock. Once I popped a juice box and Yoshi full sys on it, it was burying the needle at 70. That’s with my 234 Lbs on it too. Around here people run 60-70 on 35mph roads. Only someone with a death wish would pull out of my driveway on that thing. Taller in the saddle than my GS500. They must grow little people big where you’re from. I dunno…. I’m more of a Lazareth LM 847 type of guy myself; to each his own. Egad! Both ends of the spectrum for sure. Given a 2-3 mile straight with a slight downhill, the Grom can hit an indicated 80, don’t know how that converts to actual speed. This thing would be a hoot for runs into town, commuting, and general short distance motoring. I know some guys considering a Grom ride across the country, now there’s a new entrant. I would go crazy going that slowly, but that is just me. This little 125 does look like a hoot to ride, but it would just have to be a local playbike. I wish I could have a fleet of bikes, this would likely be one of them! Just curious Dirck, exactly which bikes compromise the “small street” catagory? Ninja 300, R3, CBR300, Grom, etc. This is great! Just what the industry(sport) needs to bring in new riders. Non freeway legal is good for a learner bike-better chance of survival. I agree, but are the “learners” the ones wanting these? When I was filled with motorcycle lust as a young boy I would have killed! I didn’t care that there were bigger, faster bikes out there. All I knew was that little trail bikes, including the various Mini-Trails when they came to market, fit right, were a blast and as reliable as an anvil. Seems like motorcycling has changed in many ways. Although we thought we were cool it seems like bikes are more for image and status today than I remember back then. So who exactly are buying the “Groms” out there? Kinda hard to tell MGNorge. When I was a college freshman back in 1996 I wanted a GSXR750 of that year in the black/gold/silver paint(still would buy it if I found one in top condition). I had to “settle” for a 97 Ninja 500 back then and it was”ok” to me at the time. The “millennials” are quit different from those of us that are older. With many not even bothering to get a drivers license or owning a car, these groms and Z125s might be the ticket for them. I want one for the fun factor of having a little bike to rip around on but I also have a Z1000 in the garage for bigger jobs than what this can handle. I bought my Grom as my third bike. However, I attend a few Grom meet ups on occasion. It seems like at the Grom meet ups (where we typically have 20 or so Groms in attendance) most of the owners bought the Grom as their first bike. If the Grom’s success comes from new riders then it sounds like mission accomplished to me. That is an interesting observation, Ben. I wonder if it holds true everywhere. I think that is great. My guess is that it may be different depending on the situation. I’m thinking the bike may appeal to different people in different ways. Folks who buy Groms for camping or a pit vehicle likely are not new riders and likely do not show up to meetups. However, it really does seem to me that a good chunk of the guys who really get into their Groms are either on their first bike or are stepping up from a scooter. I’m also in the Chicago area, so for a lot of people the Grom or a scooter is really all the bike they need if they don’t leave the city often. If anyone desires nostalgia for “TI” when it was a bustling US Navy base (the island is man made), rent the Henry Fonda/Lucille Ball movie “Yours, Mine, and Ours,” based on the real-life Beardsley family. Note the early scenes with Fonda driving his 25 foot long 50s American convertible around the base, which looks sparkling new in Technicolor. Dirck might enjoy this comparison to what it looked like when he buzzed around “The Island” on this Kawasaki. Seems like everyone is jumping on this phenomenon. Here is SSR’s answer as the Razkull 125. Don’t know how long that exposed unprotected exhaust will last though. Wow! A three gallon tank! Am I the only one with a brain fart, thinking $3k is a lot for a small bike like this? I picked up a used ’97 GSXR1100 for $1k, sure it needed some work, but come on. I know its 2016, and its cool to have one of these, or a GROM. I guess I am too old to understand. Who knows a cruising speed on one of these? Would it run 55, or is that too much to ask? Anybody know? Looks sweet to me, but I would need to run 55 for 5 or 6 miles every day on my commute. I did not test top speed, but I am sure that the Z125 will do more than 50mph … maybe 55. My 2008 Honda CBR125R will nudge 74mph on a level road with no wind and if I’m in a slight tuck position. It has no problem getting up to 60mph. My old Honda Trail 90 with 5hp would do 55. This has to have more power than a Trail 90. Sure, when you were 8 years-old maybe. I’d like see all eight feet of you get a Trail 90 up to 55mph now! That was a few years ago when I still owned it. I see a guy around here on a Grom occasionally. He was doing at least 55 on the road outside my neighborhood, maybe a little more. I was going 60 and just barely walked away from him going down the road. It should, my Grom will cruise 55 mph easy. I find myself cruising around 60 mph on occasion. I’ll wait for a Yamaha – Yellow and Black! This may seem like a strange observation, but why, when there is only a single exhaust, is it always on the right side? I honestly cannot think of a single cylinder bike out there where the exhaust is not on the right side, even going so far as to include bikes like the old Kawasaki triples, the 3rd pipe was on the right. Meh, it didn’t keep me from buying my 390 Duke. Just off the top of my head I know both the KTM 690 Enduro and SMC models have the exhaust routed on the left. I don’t know about all the other bikes but my Honda XR600R has the exhaust on the right because the muffler would interfere with the chain if it was on the other side. It may have to do with nothing more than tip overs tend to happen on the left, as when coming off the side stand. Putting the exhaust on the right gives it a fighting chance to survive awhile. Look at parts availability for older bikes with mufflers on both sides and it’s the left-side ones that go first and become the hardest to locate later. Probably related to standard motorcycle controls. Shifter and clutch on the left side, probably cheaper to put the chain in the same side, leaving exhaust to the other. Same reason front single disks are usually on the right side? Virtually all dirt bikes have the front disk on the left side. Traditionally, most racing is done counterclockwise. Keeping exhaust on the high side is prudent. People tend to step on and off from the left. Keeping hot pipes away from them, is prudent as well. BMW Boxers had exhaust on the left side for a good while after they went to a single sided swing arm. But riders complained of burn holes in their ‘Stichs, so the Germans relented. Did you fly up just for this test ride? Did Kawasaki loaded the bikes on a flat bed to transport them from SF to Treasure Is? Certainly not legal for the Bay Bridge connecting the two. Thanks for the awesome ride report! Great seeing images of the view from TI, where I worked for several years. I’ve been on that pier several times. Also Re. the other images, from the top: Fort Point, Twin Peaks, North Beach, and TI…good memories of SF. I did fly up to SF, and the bikes were taken to TI on a truck. We did not ride them on the Bay Bridge. TI is an interesting place. Nothing like what I expected. I’m left wondering why there isn’t a 150cc+ version of this and/or the Grom. 150cc would make it freeway legal and big-bore kits are a popular upgrade for the grom already. Most markets where these bikes are sold have tiered licensing where 125cc is a normal cut off. Even a 150-160 version with maybe 9.5-10hp (the 125 makes about 8) on tap it wouldn’t be a very good idea on the freeway. I agree that there’s no making this a “highway cruiser”, but the possibility to legally hop an exit or 3 might increase it’s appeal in our largest metro areas, where some amount of freeway is almost unavoidable. I’ve seen grom kits that claim 5-9hp increases (and the ability to gear up), but with less than 2gallons of fuel on board, that could make for lots of gas station visits. I saw a guy with a helmet kneeling down in the middle of the street praying. Turns out he was on a Grom, a small view from my truck and the best reason to attach the Grom to the back of your RV and keep it off the highway. It presents a very small target to other drivers. It would make a nice hood ornament on a ’59 Cadillac. At one point, my “freeway commuter” of choice, was an Aprilia RS. 50cc…… Looked more like a “real bike” than these do, and LA freeways during commute hours (or any hour for that matter) was/is such that I still blew by the cagers. In the end, I realized that i wasted more time and money on keeping the little Ape running, than I could ever hope to save in hours and gas…… The Grom, from what I hear, is more powerful, faster and pretty much standard fare Honda reliable. But when ridden by a full sized human, I’m not sure it will do as good a job fooling the CHP about it’s suitability for freeway use. Maybe Yamaha’s entry will be an R 0.1….. Uh? Idk man, my Grom sits up just as high as a 600. If you can’t see a Grom your not gonna be seeing any other motorcycle either. Fat girls and mopeds . . . . . . .
Lots of fun until your buddies catch you riding one. You sound like quite the voice of experience. BTW do you often find yourself saying, “hold my beer and watch this”? It looks like a lot of fun. I could see many of these things flooding college towns in particular across the country. It will be interesting to see what sort of accessories Kawasaki develops for this bike. The beauty of a scooter is the incredible amount of storage space you get in proportion to the size of the machine. A really well-designed and integrated rear mounted luggage box with quick release and “ride-n-carry” function would probably be attractive to prospective customers for this bike. These kinds of bikes are huge on military bases. I’ve seen quite a few groms on base at Fort Sam Houston in San Antonio the last couple years each time I go to visit family. Hopefully Kawasaki can catch one with this one. Cheaper and more fun than most 125cc scooters. See? Multiply the fun factor of that minibike by 10, and make it street legal. That’s what we have here! I feel bad for anyone who can’t see the appeal of this bike. Stodgy old farts. Yeah, going to have to get one as soon as my local dealer has them. As much as I love riding my Z1000 I only live 4 miles from work using back roads so this little dude would be a blast. Plus I think it would look cool sitting next to it’s big brother in my garage. The Grom seat is a 2×4 covered in vinyl. The Z is actually comfortable in comparison. Much like a “seatconcepts” replacement foam on the Grom. I have a modded Grom and its a blast but its now too loud and obnoxious. I may need to get a Z125 as a campground pit bike now. Then I can set up some parking lot racing with the two! I can think of a whole bunch of good used motorcycles I could buy with 3K. Yeah, but you can say that about any brand-new bike. Actually, no you can’t. Most new motorcycles go for more than 3K. I hope no bystanders were hit when that point flew over Beasty’s head. Thanks. You saved me from having to figure out how to post his error without being offensive. He was saying you can always say there are plenty of good used bikes at that price in regards to any new bike. So, someone could say they could buy numerous used bikes @3K even if the discussion was about a 30K Goldwing. Why? I picked 3K because the topic of discussion was a new bike priced at 3K. That was the comparison. To previous reply’s – How many of those bikes can you ride all the way to their limit on the street and not be hauled off to jail? That’s the fun factor. You are always gripping and ripping on it. So you’re saying this thing is slow and that’s the fun factor? I don’t understand the logic. It’s more fun to ride a slow bike fast than a fast bike slow. It’s an old adage that for me at least, is definitely true. Believe -it-or-not. I’ve never understood that saying, you can only ride a slow bike slow, and what fun is that? however you can ride a fast bike slow or fast. THat seems more fun to me. It’s always fun to ride a slow bike slow as long as you are going as fast as slow can be…follow me? You wind it out in the first 2 gears and you are only doing 40 mph, so no real danger to one’s driver’s license. I’ll be posting a thread on my new Grom over on the CB forum soon, so keep your eyes peeled. It’s the being able to ride a bike WFO without the feeling that you’re going to kill yourself (pull your cape out of the closet and dust it off) or attract too much attention from the local constable. It’s all about the rider being able to place the speed limitation on the bike instead of himself. That makes for a better experience than being forced to admit one’s own limitations as a rider on a fast bike. lol! I test rode an R3 at a local Yamaha test day. At one point I took off an gassed it, shifted, gassed it, shifted, gassed it, and looked down and I think I was going 29 miles an hour. To me it was NOT fun and lord knows I am not an aggressive rider. All that effort to go bicycle riding speed. would have been awesome at 16 years old, but by 18 I had outgrown that kind of performance. Maybe on a go cart track with a bunch of guys on them. I don’t find anything fun about Flintstoning a wimpy bike around on the street either. These bikes can indeed be a hoot, just not in typical street use. A parking lot, dirt track or kart track – absolutely. Like a dual-sport, the blinkers, headlamp and license plate should only be considered a means to get somewhere fun without a trailer. Mickey, the problem was that you had already shifted into third before you even hit 25 mph. Poor little bike. If you let it breath a little, you’d be surprised at what an R3 can do. lol trust me Todd I was wringing the thing a LOT harder than I do my bigger bikes, just wasn’t getting anywhere. Same ride I was coming down a big hill with a curve and a slight uphill at the bottom. Got to the bottom and tried to give it gas to go up the next hill and it went nowhere, I quickly had to down shift a couple of times so I could pick up speed again. All that shifter dancing… just to go slow. Mickey, I’m sorry if I’m beating a dead horse… You said you had to down shift a couple of times at the bottom of the hill to get going. That tells me you slowed WAY down for the turn while you were in top gear coming down the hill. Do the little bike a favor and don’t up shift so much in the first place! You were obviously in too high of a gear for the speeds you were going. You’ve admitted in the past that you run your CB1100 between 2500 and 3500 rpm with the occasional blast to 4500. If that is the case then you are only getting 20-25hp out of your 1100, something the R3 can do all day long, easily. Why is this level of performance perfectly acceptable to you on your 1100 but not at all acceptable on an R3? Todd guess it has something to do with the CB having over 60 ft lbs of torque at 3000 rpms and the R3 only having 19 ft lbs of torque at 9000 rpms. It’s not all about horsepower. That’s true, that’s at full throttle but it still results in the same performance so, yes, it is all about power. 19 lb-ft at 9000 rpm will give you the same acceleration as 60 lb-ft at 3000. I get that you enjoy your bike. I would too. I just get a little frustrated when people discount a small bike because they expect to be able to short-shift and lug it around the same way they do with the big bike. Ridden the way the designers intended will result in the same performance and also be enjoyable – just in a different way. Full throttle on the R3 nowhere near full throttle on the CB. My first street bike was a 50cc 2 stroke Aermacchi so I know about keeping a bike on the boil so to speak. I just don’t enjoy riding a bike around near redline all the time and having to row the gearbox to keep it there. Riding like that is work for me, and I don’t want to work at riding my bike. It’s something I do to relax. I understand some people do like riding like that though and small displacement bikes are wonderful for them. Riding a large displacement bike like that would quickly get you into trouble, if not physically, certainly with the law, although I understand some people like riding large displacement bikes like that as well. I am just not one of them. I think you are misunderstanding me. Full throttle isn’t full redline. Full throttle at 3000 rpm on the CB is the exact same power/torque at the rear wheel/acceleration as full throttle 9000 rpm on the R3. The Yamaha will have a performance edge because it’s 150 pounds lighter. 9000 rpm is mid-power band on the Yamaha just like 3000 is maybe a little under mid-band on the CB. You are the one shifting. If you didn’t shift so often on the R3 you would more likely to be in the powerband. If you’re always shifting up to a higher gear you’ll have to shift right back down again to accelerate hard. I enjoy big bikes, I just enjoy small bikes more. This is precisely why I would not feel comfortable buying a used Grom! I seriously doubt if any have been broken in properly. Who can expect a motor to be operated at or near red line all the time, and last for years? People buy them do a lot of mods and abuse the heck out of them before putting any significant miles on it. Nice, but may have missed the wave. Wonder what that faux radiator shroud is hiding. A styling exercise I suppose. Looks like an air cooled engine. Shouldn’t be difficult shed another 15 or 20 pounds. Lots of grins for 3k. My daughter wants one of these in the worst way when she reaches legal age. My only concern is that they are so small, that it wouldn’t stand out in traffic enough to be noticed. I have enough issues on my FZ1 about not being noticed, so I can only assume that it would be worse on one of these. Heck, my 4×4 SUV doesn’t seem to standout in traffic either. Honestly, there is this guy close to where I live that rides a Grom that I have seen on the road occasionally. You can see ever head in every car turn towards him as he goes down the road. The bike attracts a lot of attention. These little bikes have that “freak show” effect me thinks. I bought my Grom to commute to work on, but sometimes I find myself taking my 600 when I just want to be left alone. On the Grom, during my 15 mile commute, at least one person always says something to me at a light. If I stop at a gas station people literally will come up and start asking questions. When I’m on my 600 by comparison, people seem to just forget I’m there. I think about the same thing with my kids on ANY kind of motorcycle. I’m sure they’re going to want to ride on the street when they’re old enough, but I won’t let them do it until they have many years of off-road riding, and maybe even some track days under their belts. As much joy as I get from motorcycles, I hope everyday that my kids will want nothing to do with them as they get older, and I do nothing to encourage their interest. If they do ever show a desire, my plan is similar to yours: they are going to learn their skills in the dirt for a long time, go to riding school (real riding school, not MSF) and show proficiency at track days. I started my son dirt riding on a Honda Z50 when he was 5. He’s now 37 and been riding on the street for 18 years and is a great street rider. Just bought a new FJ-09 after riding his FZ-1 for 10 years (he also has a Ducati Monster 696 which he got as a wedding present from his wife 7 years ago). We ride together frequently and take an annual out of state week long trip together. His son is 3 and there is already a Yamaha 50 waiting there for his legs to get long enough to reach the ground. Riding with my son brings me great joy. Hope I live long enough to ride the street with my grandson as well, but that would be asking the Lord for a lot. I have been riding with my son for years, graduating him to bigger bikes now and again. After 10 years of off-roading he passed the big bike test at 16 and after a couple years on a WR250X at 18 he just upgraded to a CB500X. We sluffed school/work last week and took a 100 mile lap around the lake with our bluetooth helment communicators talking about all kinds of topics. I wouldn’t trade all the time riding with him for anything. Risk vs reward I guess.. It is definitely a conflict for me. It is a special thing to share something I love so much with my kids and have those moments like you describe. Fortunately, I love lots of activities – hiking, climbing, snowboarding, mountain biking – that I can share with them and have those special moments with far less risk to my little ones. If they ever show an interest in riding (I suspect the little one will), I’ll make sure they get a proper riding education and hopefully enjoy many moments like you and your son. But I am not going to try and push them in that direction. It is just a personal decision. all you can do Jeremy is teach them right and gear em up when they are young and hope they learn the lesson. Once they turn 18 you have very little control over them. And yes I still worry about him on the road even though he’s almost your age lol. You never stop being a parent, and they never stop being your little one (even if they have 3″ in height and 20 pounds on you). What about one of those florescent orange delta flags on a white fiberglass pole? The bike tops out at 40-45mph, so I can’t see the wind whipping the flag off the bike. Not a workable solution… The additional drag caused by the pole and flag would drop the top speed by another 10mph. A fluorescent orange helmet and vest would work better. Tests have shown that white or flouro yellow helmets are the most significant thing a rider can do to improve visibility on the road. The seat height on this bike is 30.7″ with an upright riding position. Volume of the motorcycle notwithstanding (also shown to not mean much for visibility), the rider on this presents a taller profile than many bikes already on the road. These bikes are just a ton of fun! A man could ride a pink one while wearing a tutu if he wanted to. A man who questions his own manhood could not however. Poor chap. That’s why Hardleys sell so well. I guess its Ok to ride one,but leave your man card home.your just a boy riding one.reality. You have no idea how ridiculously fun these are do you? Too busy maintaining his “manhood”. Definitely feel like a boy again when riding the Grom! i’d rather have “fun” on a DRZ400SM or a SV650. You’re talking about “man cards”, and then you pull out an SV650? So…. I have to leave my man card with my Z1000 then? I’m buying on of this little dudes as soon as my dealer has them.